This cabin is nestled in the woods with a view of Locke Mountain and is just 3 miles to Sunday River Ski Resort. 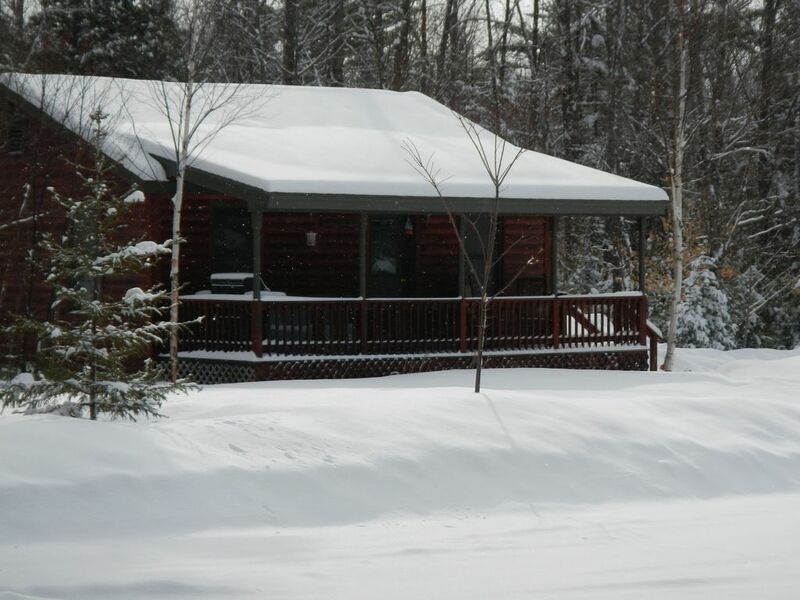 Snowmobile and trails for snowshoeing are accessible from the property. The trail links with a main corridor which has endless miles of snowmobiling and skiing right from your doorstep. The cabin was built in 2004 and is clean and comfortable. 2 bedrooms, 1 bath, living/kitchen/dining area with a corner gas stove. Close to everything, very clean and comfortable. Our second stay at the cabin and it did not disappoint. Very cozy, comfortable and spotless with everything we needed to cook a few meals, pack ski lunches, watch the Olympics (and everything else imaginable!) and stay connected. Great location off the access road yet provides plenty of privacy. We’ll be back! Great little cabin, perfect for the three of us and easy access to the mountain. Cozy well stocked cabin with everything you need for a comfortable stay. Perfect cabin for the weekend! We stayed here with another couple when we went skiing at Sunday River. Very close to the ski resort and the town of Bethel The cabin was very clean and very well maintained! Bathroom was clean with a good shower. Kitchen is well equipped with a fridge, cooker, microwave, coffee maker, a lot of utensils and plates. 2 Bedrooms with nice firm mattresses. Would definitely go here again. Sunday River Ski Resort is just a 5 minute drive with 133 trails and 8 mtn. peaks. House is located at 93 Will View Road(off Sunday River Road) Snowmobiling, cross-country skiing, snowshoeing just outside your doorstep with trails linking to local restaurants/bars and wilderness.